Gareth Evans believes Oli Hawkins is helping him flourish as a number 10. The 30-year-old has been used in a central attacking position by Kenny Jackett this season, repaying the manager’s faith with seven goals already this term. That tally has put Evans joint-top of Pompey’s scoring charts. And the ex-Bradford City man has heaped praise on front-man Hawkins for his help after a positional switch. Blues boss Jackett has opted to start with the former Dagenham & Redbridge forward to lead the line for the majority of their League One title charge. And Evans says Hawkins’ all-round game compliments him. ‘Oli (Hawkins) brings me into the game a lot, which obviously helps,’ said Evans. ‘His hold-up play is really good. ‘I’ve really enjoyed playing with Oli. ‘He’s a great lad and a really good player. ‘Oli’s attributes seem to contribute towards mine, in terms of bringing me into the game. ‘He’s also managing to get himself into the box around the front post a lot more now, getting on the end of crosses from Jamal Lowe and Ronan Curtis and scoring goals. 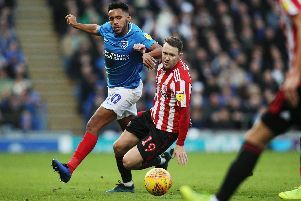 Hawkins had very little Football League experience after arriving at Fratton Park from the National League Daggers back in August 2017. And in that time Evans has seen a great deal of improvement in the striker’s game. The forward was forced to settle for a bit-part role last season, with Brett Pitman netting 25 goals in all competitions. Although Hawkins has been Jackett’s preferred option up top this term. And Evans feels the forward is getting better all the time. ‘His hold-up play has got better and he’s improved a lot since coming in. ‘Oli’s worked on his strength and his fitness which is showing on a Saturday. ‘He had a bit of an introductory season for him in League One last season. ‘It’s helped him to get to grips with it and this season he’s really coming to fruition and showing the player he can be. ‘Whoever he plays for you know he’s going to get around 20 goals a season for you.